We thank you for visiting our booth during Interclean 2018 which was held in Amsterdam recently. 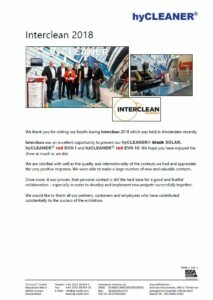 Interclean was an excellent opportunity to present our hyCLEANER® black SOLAR, hyCLEANER® red EVO I and hyCLEANER® red EVO III. We hope you have enjoyed the show as much as we did. We are satisfied with well as the quality and internationality of the contacts we had and appreciate the very positive response. We were able to make a large number of new and valuable contacts. Once more, it was proven, that personal contact is still the best base for a good and fruitful collaboration – especially in order to develop and implement new projects successfully together. We would like to thank all our partners, customers and employees who have contributed substantially to the success of the Exhibition.